Well, where should we be? And how should we get there? Let’s work left to right. We are currently at 2.6% so we have some work to do to increase the soil organic matter. Here is where we need to be careful. Our phosphorus levels are very high and some composts will increase phosphorus levels, particularly composted manures, which we have a lot of. We are going to need to consider a different route in adding more organic matter. Compost from crop residue and yardwaste tends to have lower phosphorus residues so we will be utilizing this type of compost this year. Napa Waste and Recycling sells compost for $10/cu. yd. which is a screaming deal compared to other suppliers. Compost weighs approximately 1,300 lbs per cubic yard. Soil weighs about 46,000 lbs per 1,000 sf x 6″ deep. 4% organic matter equals just over 1,800 lbs of compost. We currently have 2.6% organic matter or 1,196 lbs so we will need to add 600 lbs or half of cubic yard, give or take. We are fairly deficient in Nitrogen having less than half of what we need for vegetables. Nitrogen is tricky as you don’t want to dump a bunch on all at once. Doing so will lead to overgrowth or burning of plants. We’re going to go with feather meal which is a slow release (6-9 months) nitrogen fertilizer. It also won’t add any additional phosphorus to the soil as it’s NPK is 13-0-0. 13% of feather meal is nitrogen so for every pound of feather meal we apply we are adding 0.13 lbs of nitrogen. The recommendation is that we add 2.9 lbs of nitrogen per 1,000 sf. Since our garden beds are just over that we’ll round up to 3.0 lbs total. We will then need to apply 23 lbs of feather meal to our beds. The recommendation above says to do half before planting and the second half later on to avoid salt damage. Since we are not using a chemical fertilizer and it is slow release we will go ahead and apply all of it. We currently have, depending on which test we follow, 95-125 ppm of phosphate in our soil. Converted to pounds per acre and we have 190-250 lbs/acre. We have over double of what we need. The upper threshold of phosphorus is 300 lbs/acre. Above that limit and it starts to become a pollution issue. For now there isn’t really a remedy other than reducing the amount of phosphorus we apply to the soil. Removing all crop waste and not putting it back on the soil can also help reduce it. The one benefit of having a high phosphorus level is that it binds with any lead that is in the soil stabilizing it so it is no longer hazardous. The EPA is currently applying massive amounts of phosphorus in the form of fish bones to urban gardens throughout Oakland to help bind lead pollution in the soil. We are above the optimum level of potassium which is fine. Plants will just absorb more potassium than they need. Too much potassium, however, can antagonize the uptake of calcium. None. If we were deficient we would add sulfate of potash since we are also deficient in sulfur. If sulfur levels were fine we’d go with greensand to replenish potassium levels. Clearly our soil has plenty of magnesium. Actually levels are high enough that they can cause drainage problems and potassium uptake issues. Increasing soil calcium:magnesium to a ratio of 5:1 will help reduce the CEC through competition. If we were deficient I would add K-Mag. 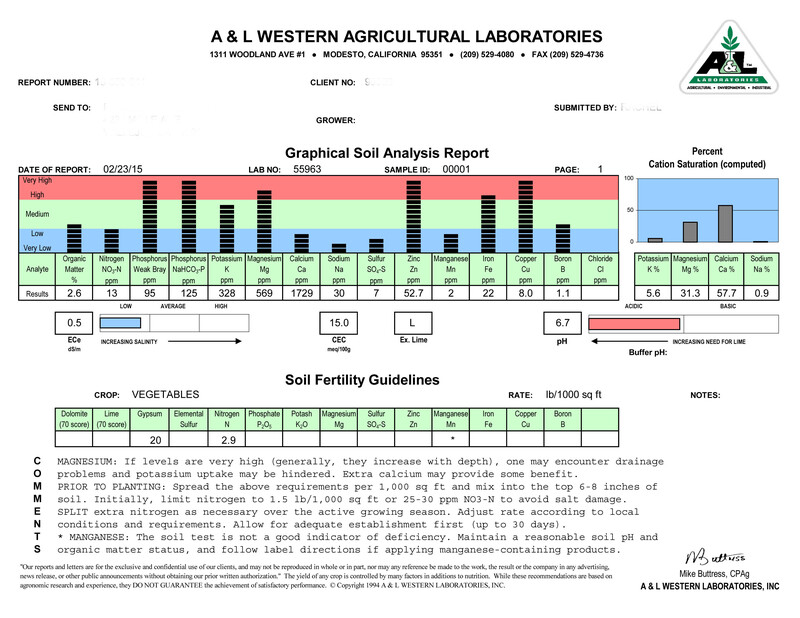 Considering our clay loam, the low level of calcium is concerning. We do have issues with blossom end rot on tomatoes and peppers (caused by calcium deficiency) and we usually can help mitigate that by throwing in some egg shell into the planting hole. It appears that we need to do something as a whole. Gypsum will be applied at 20 lbs per 1,000 sf per the recommendation on the soils analysis. The gypsum will also help improve the sulfur deficiency. Sodium has no real use by plants and excessive levels can burn them. No need to do anything. If we had excess sodium we would water heavily to leach it out (did this a few years ago when our CEC was 5.7%). We currently have less than half of what we need to avoid deficiencies. Our soil used to have 121 ppm of sulfur so it’s a huge drop and shows that sulfur is used quite a bit by plants. What’s interesting is that sulfur is used to help acidify soil but when we had such a high amount our soil was actually neutral and now it’s it more acidic (ever so slightly) with a lower sulfur content. This is most likely due to the leaching of sodium from the soil. Gypsum, which is 18% sulfur will be applied. This will help us with both our sulfur and our calcium levels. The recommendation is 20lbs per 1,000 sf. Zinc is most important for bean and corn production though it is a micronutrient for most most crops. We are about in the middle of the optimum level needed for corn and beans, which we do grow. None needed. If we were deficient we would look into applying zinc sulfate which is 35.5% zinc. Soil tests for manganese are unreliable, however our manganese levels were once much higher. Acidic soils allow for manganese to be more bioavailable to plants, however we had a much higher level when we had a more basic soil (41 ppm). Now we are down significantly to 2 ppm even though our soil is more acidic. Manganese toxicity can happen so you have to be careful with application. Toxicity is more likely to occur, however, if the pH is less than 6.0. Manganese sulfate is 31% manganese. We would need to add less than a pound of manganese sulfate to our garden. For now, because we aren’t growing any crops that need a high manganese level in the soil and manganese sulfate is difficult to find in small quantities we will forego application. If during the growing season we see signs of manganese deficiency we will foliar feed with a product that contains manganese. We are slightly below the optimum level when we were previously over the level. Like other nutrients, more acidic soil makes iron more available. So far our plants haven’t been showing any signs of iron deficiency. The levels still show as high so for now we won’t be adding any additional iron. If the level drops further we’ll look into adding iron sulfate. If we see signs of deficiency this year we’ll apply a foliar treatment of iron chelates. We are over the limit which can be toxic to soil fungi and plants. Our property was once an orchard which would explain the high level of copper. Spraying of copper has to be done carefully and thoughtfully. Gypsum and compost can be used to lower copper levels. Copper binds to organic matter making it unavailable. We are already planning on applying both compost and gypsum so this should be remedied. Due to goats needing a copper rich diet we will also have to limit the amount of goat manure we apply since they do excrete it. A level over 1 ppm can be toxic to some plants and, of course, we’re over that at 1.1 ppm. So far we haven’t seen any negative effects and our levels have actually gone down over time considering we were at 1.5 previously. Acidifying the soil with sulfur can help reduce boron, as can leaching with water past the root zone. Unfortunately leaching will also remove other nutrients that we want to keep so for now, since we haven’t seen toxicity problems we are going to leave it be. If there was a deficiency we would look into adding laundry borax at very low rates. Yes, laundry borax. While we do have some deficiencies that we need to take care of, it’s not too overwhelming and easily remedied. Next weekend we’ll be making a trip out to the farm supply to get the needed amendments. Hoping the upcoming season is a productive one!